Parsley. Some use it for Karpas at the Pesach Seder, but otherwise it’s a rather humble herb. Enter Moss. 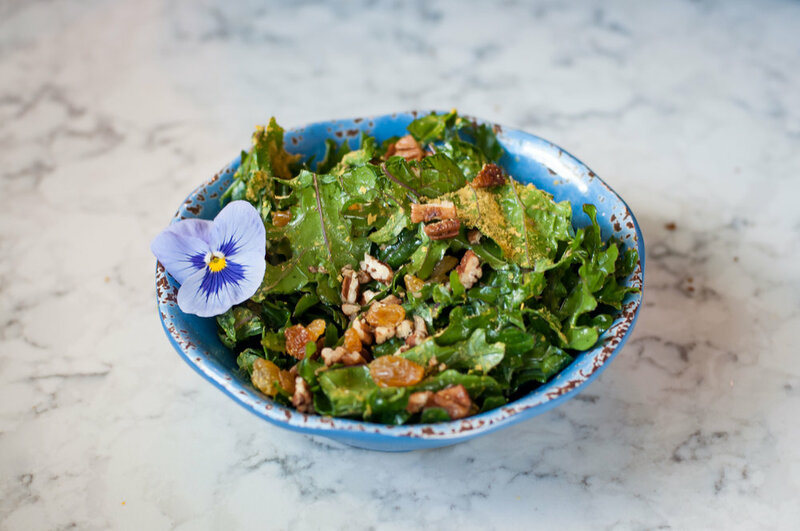 Moss Café is known for locally sourced and seasonal farm-to-table fresh deliciousness including Ben’s epic sourdough bread, life-changing salads, and of course, their mind-bending sauces. Founder and owner, Emily Weisberg, kindly shares their Green Harissa recipe, which we’ve renamed Karpas Green Harissa, in honor of Pesach. Blend everything EXCEPT oil in robot coupe/food processor/blender. Add oil slowly in thin stream. When finished, press through a sieve to remove any large leafy parts. Enjoy with roasted veggies, quinoa, or MATZAH! Tahini is not just for your falafel. It adds creaminess and protein to this frozen fruit and veggie smoothie. With maple syrup season almost here, this drink will tide you over until fresh vegetables start to grow this spring! Blend for 2 minutes and enjoy! Fun fact: Carrot Cake Day is on February 3! Celebrate this awesome root vegetable cake with our vegan/parve recipe that you can make in 1 bowl! Thank you to Minimalist Baker and Loving It Vegan for the inspiration for the recipe. Preheat oven to 350 degrees F (176 C). Prepare two 8-inch, 1 9x13-inch, or 3 6-inch round pans with oil and dust with flour. Set aside. Mix flax eggs in a large mixing bowl. Add oil and maple syrup and whisk to combine. Next, add applesauce, sugars, salt, baking soda, baking powder, and cinnamon and whisk to combine. Add almond milk, grated carrot and flour and stir. The batter should be thick but pourable. If too thick, add ¼ C almond milk. If adding walnuts, add at this time and stir. Divide the batter evenly among cake pan(s). Bake for 40-50 minutes or until golden brown and a toothpick inserted into the center comes out clean. Note that the size of pan you use will vary baking time. Once batter is in the oven, clean the bowl and mix frosting ingredients together until desired consistency is reached. Remove from oven and let rest in the pans for 15 minutes. Then carefully run a knife along the edges and gently invert onto cooling racks to let cool completely. If short on time, you can speed the cooling by placing the cakes in the refrigerator or freezer until very cool to the touch. Once cooled, you can serve as is or frost! Store leftovers at room temperature, covered, for 2-3 days, in the refrigerator for 3-4 days, or covered well in the freezer for several weeks. However, it's best when eaten fresh. The parsnips and rosemary make these farm-fresh biscuits heavenly. The almond and coconut flours make them Gluten FREE! This extra special recipe comes from our midwestern Jewish Farmer friend Jess Wolfe, the Farber Farm Educator at Tamarack Camps. Blend and knead all ingredients into dough. Form 1 inch dough balls. Place dough balls on baking sheet, giving ample space for rising. Check 1 biscuit with a knife or toothpick. If dough sticks, bake for 3 more minutes at a time, checking until it comes out clean. Let cool on baking sheet for 5 minutes, then transfer to cooling rack. Bubbe’s classic potato latkes will always be the best, but try a twist on the classic with this seasonal root veggie MaccaBEET latkes. Beets and carrots love the cold weather. In fact, they sometimes get sweeter with colder weather! Enjoy! Place shredded vegetables in a dish cloth and squeeze out as much liquid as possible. Heat 2 tablespoons of olive oil in a frying pan. Spoon dollops of mixture in the oil. Fry each side until browned. Let dry on a paper towel. In Parshat Toldot, Esav wanted red lentil soup so badly that he was willing to barter away his rights as a firstborn for a bowl. Maybe don't do that, but definitely try this recipe - full of seasonal ingredients that we grow with our students. Stay healthy with this nutrient-rich vegetable lentil soup! 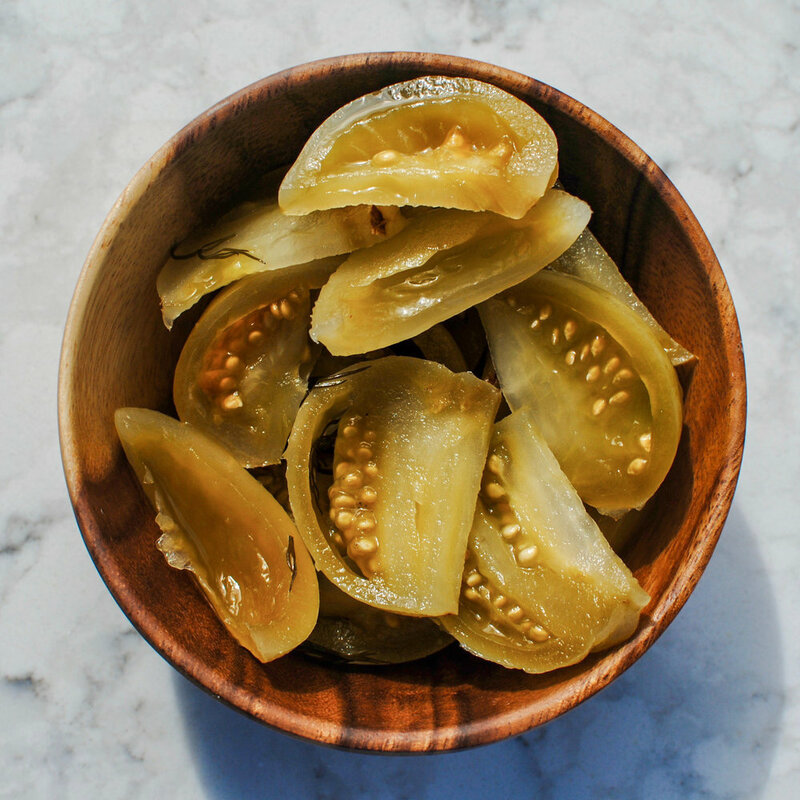 Lacto-fermentation is a delicious and nutritious way to pickle your veggies, and it saves your crops from rotting away! There’s lots of ways to ferment your veggies, and you can mix and match veggies to create your own special recipes of custom pickles. Enjoy! Pour in the salt-water brine over the vegetables. Leave an inch of space at the top of the jar. Cover the jar with a tight lid and leave to ferment at room temperature for a few days. Burp your jar daily to release pressure. Brine will turn cloudy and bubbly. Nothing says peak summer harvest quite like these three ingredients: tomato, basil, and corn. We give you this recipe to enjoy all three in a bright, fresh, and easy dish! This super easy recipe highlights some summer garden favorites. Try it with your favorite heirloom tomatoes and corn! The recipe is incredibly simple - so feel free to tweak it as you like. Thoroughly wash all of your basil, and check for bugs! This pesto is the perfect home-made condiment, bringing some super greens into your diet. Use it as a dip with chips, as a spread on toast/sandwich, mixed into pasta, mixed into eggs, or as a base for homemade pizza. We recommend you try it as the secret sauce for this quinoa bowl. It has the added bonus of being vegan, nut-free, and gluten-free! Scroll down for the recipe, or click here for a pdf version. Thoroughly wash all your greens, and check for bugs! Add all ingredients except the olive oil into a food processor. Mix until ingredients are finely chopped - approximately 1 minute. While machine is running, slowly pour in olive oil until it is fully incorporated. Taste pesto and adjust seasonings as necessary. This fun kale salad is sweet, tangy, and zesty! The best variety for this salad is Red Russian, but other kale varieties will work as a substitute, if you can't find Red Russian. Red Russian Kale is rarely sold in farmer’s markets, and is uncommon even in CSA shares, but you can grow it in your home garden very easily. Try growing these seeds. Harvest the outer leaves once they’re at least a foot tall. The plant will keep producing more leaves, and you’ll keep enjoying the fresh kale! Remove kale leaves from stems by pulling along the rib. Chop kale into 1” strips (or your preferred “bite” size). Wash and inspect kale to ensure it is bug-free! Move clean kale to a large salad bowl, then drizzle oil and sprinkle salt. Gently massage kale with olive oil and salt (30 seconds). Squeeze the juice of half a lemon onto the kale. Taste, then add other half if necessary. Add garlic, raisins, nuts, and nutritional yeast. Toss the salad. Garnish with flowers and enjoy! This delicious spring salad will tickle your taste buds. The arugula and cauliflower are in-season right now in NJ, so you can probably get some at your local farmer's market. Serve this as a side dish, or add some protein to make it the star of the show. Even if you make it as a side, it might just steal the show anyways. Enjoy!! Preheat oven to 450º F. Cut up cauliflower into bite-size pieces. Spread cauliflower pieces on baking pan, and drizzle with olive oil. Sprinkle salt and pepper, then mix it all together. Roast cauliflower in oven for about 15-20 minutes, depending on how roasted you like your cauliflower. We recommend golden colored, with brown tips for a little crunch (closer to 20 minutes). Remove cauliflower from oven. Store separately if you will prepare the salad a few hours later. If serving immediately, continue below. Empty all arugula in a large salad bowl. Add the cauliflower and the nuts. Prepare the dressing by mixing all ingredients in a leak-proof container. Close lid, and shake to mix. Pour the dressing over your fresh salad, and enjoy!